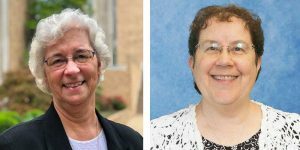 Springfield, Ill.—On Sunday, November 11, Springfield Dominican Sisters Anita Cleary and Marcelline Koch will travel to El Paso, Texas to volunteer at a Catholic shelter for asylum seekers called Annunciation House. Sister Marcelline is the justice promoter for the Springfield Dominicans and Sister Anita is a team member at Jubilee Farm, one of the sisters’ sponsored ministries in Springfield. In Guatemala, El Salvador, and Honduras as well as Mexico and Brazil, extortion and the threat of violence are pervasive, according to organizers at Annunciation House. They also say that law enforcement is compromised in many communities, making credible protection of citizens there non-existent. As a result, many families—feeling the threat especially to their children—are fleeing. A second major factor is severe poverty, especially in many areas of Guatemala, that leaves families struggling to feed their children. The four women are driving a van-full of food and toiletries donated by local dentists and church groups.